Does the icebreaker affected by System Seizure hold its strength only during the run when System Seizure is triggered, or during every run that turn? The icebreaker only holds its strength until the end of the run System Seizure was triggered. While System Seizure is active, how long does the strength boost of an icebreaker last if the Runner boosts its strength outside of a run? If boosted outside of a run, its strength resets to base immediately, just like Gordian Blade and other icebreakers that hold their strength until the end of the run. While System Seizure is active, if the first time the Runner increases the strength of an icebreaker is from installing one while LLDS Processor is installed, how long does the +1 strength last? Any additional strength applied from installed LLDS Processors last until the end of the turn. If the Runner boosts the strength of that icebreaker during a run through other means, those strength boosts last until the end of the run. Crypsis. That's right, Crypsis! The traditional flaw of Crypsis is that the costs overall are too high compared to just using something else. This card cuts those costs right down, making Crypsis the most no-frills option for a cheap all-server solution...as long as System Seizure remains up. And therein lies the problem: This probably can't be your primary game plan, and if it's not up then Crypsis is quite lackluster. So you're running it with a bunch of normal breakers to keep costs down, and at that point how much benefit are you really getting? Faust. Now this is more like it. System Seizure greatly increases Faust's reach, making it far less draining to crack multiple ICE with the famous AI breaker. I think this card will fit well in the Current slot in Faust decks. Brahman. Only goes in specialize decks, but given how horribly inefficient Brahman's strength boosting is it benefits quite a bit from this card. Eater. Like Crypsis, but usable. Overmind. I think Overmind decks will quite like this card. Between using counters to break and System Seizure, you're looking at breaking an entire server for the low, low price of "the highest ICE strength in the server" so long as you have the counters. And an Overmind deck where the Overmind doesn't have enough counters isn't really much of an Overmind deck at all, now is it? An honorable mention goes to Aghora, which while it can't crack all ICE will generally be targeted at ICE that is expensive to break, which makes a cost saver like this quite welcome. 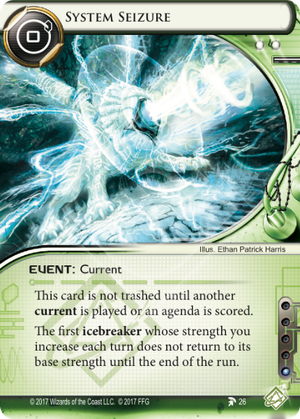 Finally, it is a 0 cost 1 influence current which means it doubles as a good way to turn off the Corp's current in a deck that wants to use it. This might even make it worth using in cases where the benefit is more marginal.